Wishing you a pleasant Memorial Day today. My image today is a combination of 4 different images "Focus Stacked" together to create more detail at close range. 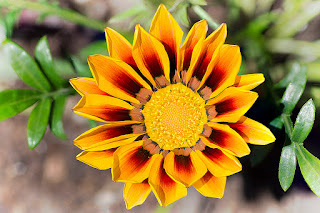 This is a Gazania bloom macro. I have had a pink variety of this flower before but decided to try this vibrant yellow variety this year. It's quite the burst of color on my deck.